When quizzed on his influences, Faruk Šehić instinctively selects Jorge Luis Borges as one of his ‘literary gods’. Yet erudition and animation need not be so exclusive. The Bosnian author’s existence seems bipolar, founded upon the meeting of unlikely identities: a subtle poet and a grizzled soldier in symbiosis. Speaking of his days as a commando, he grins at the recollection of keeping an American poetry anthology in the ammo belt of his Kalashnikov. (Ginsberg was his favourite.) Now he has won recognition as a prose stylist, and his demeanour speaks more of a shy veteran than a literary figure. 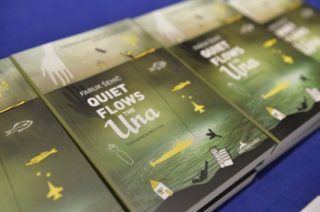 On the 31st March, the English translation of Šehić’s debut novel Quiet Flows the Una was launched at the European Bank for Reconstruction and Development in London. The audience was an international one with a strong Bosnian contingent – and the buzz in the room suggested that those in the know recognised talent when they saw it. Šehić has gained something of a cult status with readers across his home region. This publishing project was made possible by Istros Books. 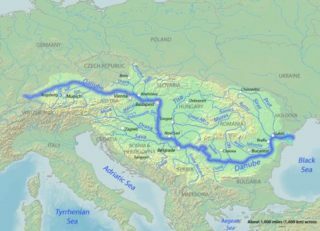 The establishment’s identity lies in their name – the ancient Greek word for the Danube river that flows innocently around and across some of the world’s most labyrinthine borders. They are dedicated to the promotion of translated literature from South-East Europe. Šehić, though, is riding a wave of his own promotion. After winning the Meša Selimović Prize in 2011 and the European Union prize for literature in 2013, his book has become a bestseller in Bosnia, Croatia, Serbia, Montenegro, and Bulgaria. Now Istros and the literary translator Will Firth have succeeded in bringing Šehić’s intriguing voice to the attention of English readers. The value of translation as a vehicle for cultural education is brought into sharp focus when you try to list the other Bosnian literary figures of recent years. After spending much of the 1990s as the tragic focus of international attention, the country has somewhat slipped out of the public mind’s eye. Šehić was born in 1970 in what was then the Socialist Federal Republic of Yugoslavia. At the outbreak of war in 1992, he was studying veterinary medicine in Zagreb, but decided to volunteer for the army of Bosnia and Herzegovina, in which he captained a unit of 130 men. His experience of that war informs all of his work, but perhaps more viscerally in his previous short stories and poetry collections. In those, his stated intention was that the reader should be able to “smell the air, smell the gunpowder, and taste the blood.” But he insists that he is not a writer of one style. Quiet Flows the Una is an introverted, meditative book, packed with densely metaphoric prose crafted into mesmerizing passages. This is a book about a man teetering on the edge of a PTSD abyss. It’s an illness that haunts veterans of all conflicts, and yet is still poorly understood by many. Šehić admits the writing process was difficult, even traumatic, and the text reads like a probing search for his own release from the things he saw. The subjects and shifts of the book are willfully jarring. He juxtaposes fluid memories of antechambers where silent masses faced asphyxiation before summary execution, to reflections on the prelapsarian 1980s of his childhood, with edenic descriptions of angling in the Una’s crystalline waters. This is a book guaranteed to leave a curious impression. That eponymous river, running through the town where he grew up, is the constant thread, the narrative flow, and indeed a metaphor for the continuation of life after the dust of war settles. The two are reading from different banks, and it’s clear that the bridge that brought us across the river is absent – and the story of Quiet Flows the Una is incomplete without it. Perhaps translation in the Balkans has a far greater historical pedigree than we recognise. After all, Jerome, the patron saint of translators, hailed from Illyria, the name given to the Balkan Peninsula in Classical Antiquity. Yet despite the multitude of stories waiting to be told from the recent history of this region, the literature remains woefully underrepresented to English-speaking audiences. In line with Istros’s mission, Will Firth is a man who is instrumental in the promotion of these stories. The translator’s academic training came in German and Russian in the 1980s, but the opportunity to spend a year studying in the former Yugoslavia between 1988-89 changed his course. 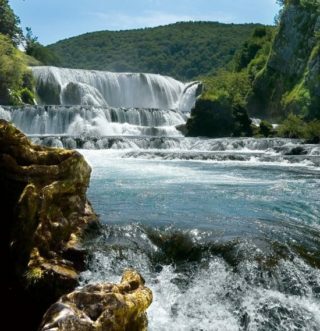 There, he honed his command of the variants of what is typically termed Serbo-Croat, a term covering the complex situation of a South Slavic dialect continuum of mutually intelligible varieties which now correspond roughly to the national languages of Croatia, Serbia, Bosnia and Montenegro. While he also translates from Russian into English, the South Slavic languages have become his professional focus – a focus that has been made possible by the emergence of Istros and their commitment to minority languages. The only thing on which we can judge Šehić is Firth’s translation, which is crisp, lyrical, and very accessible even to those with limited knowledge of the region, its history and its culture. To take a text which is so distant, and to render it into something so tangible seems faintly miraculous. 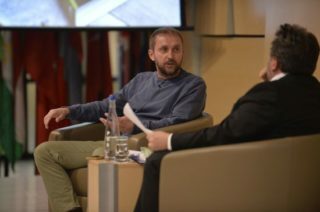 The process of the book’s translation was one of intense collaboration between the pair, and the author’s eyes come alive when asked about the value of the translator’s input. Šehić relates the anecdote of one communication between them, in which Firth sent him 45 questions in a single email. He replied with 16 pages of notes and clarifications. The translator’s eye for detail allowed Šehić to tighten even his own original manuscript. Thus the translator’s role was not the invisible carrier of stereotype – the vivid polish of this translation comes directly from working dialogue between the pair. In the aftermath of wars, the stories that grow out of them deserve a platform and publicity. Yet the presence of a single voice in translation is simply the sign of a team job well done. Šehić’s esteem for Firth’s contribution stands out, and it serves to highlight the verbal and cultural prowess required even to get work as a literary translator – a profession for which the rewards are often slight compared to the pleasure provided to new audiences by their labour. Šehić tells me that further translations are complete in Slovenian, Bulgarian and Macedonian, and others are underway in Polish, Italian, Hungarian, and Dutch. The sentiment is somewhat hackneyed, but there is truth in the assertion of literature’s powers of reconciliation. Šehić’s voice has won acclaim throughout the Balkans, and he deserves the continuation of his success with new audiences. But to each new reader, we should urge them to appreciate the debt of gratitude owed to the art of literary translation, and to those who practice it.